Yet a growing number of creative artists and actors—think Katy Perry, Lena Dunham, Hugh Jackman—have found that practicing the Transcendental Meditation technique is a powerful yet dependable way to capture the ever-elusive muse. And if one artist can boost creativity through meditation, you have to wonder what would happen if everyone on the set—singer, actors, producers, installation artists, production crew—practiced the TM technique? This actually happened when LA actress Elena Charbila (who has a dual career as a singer-songwriter under the moniker Kid Moxie) asked producer Michael Sternfeld to collaborate in creating a music video for her hauntingly beautiful rendition of the iconic score “Mysteries of Love,” composed by Angelo Badalamenti for director David Lynch’s 1986 film Blue Velvet. In just three long days of shooting and ten short days of editing, Elena, Michael, and a crew of over twenty—all of whom practice TM—created an artistic and evocative video that debuted at the “Music of David Lynch” tribute concert to a sold-out crowd of 1500. As reported in Rolling Stone, the concert not only raised funds for the David Lynch Foundation to teach TM to at-risk children, but featured an all-star lineup of Duran Duran, Moby, Donovan, Chrysta Bell, and Sky Ferreira performing music from the director’s movies and albums. Yet the real story is found in the making of the video, as the mythic power of love not only informed the theme of the song and video, but became the creative force that united the team and threaded its way through every image and sound. For Elena Charbila, the video was the fulfillment of a lifelong love affair with the work of award-winning director David Lynch and composer Angelo Badalamenti, who collaborated on the scores for most of David Lynch’s films. Although born in Greece, Elena based her career in LA, starring in films alongside Al Pacino and Malcolm McDowell. Five years ago, she had the chance to interview her personal hero, David Lynch, for a major Greek newspaper. Soon she became a contributor to the David Lynch Foundation and its radio station, Transcendental Music, to help underserved children and adults learn the TM technique. Then one day she worked up the nerve to mail her music to Angelo Badalamenti. The fabled composer not only liked her music, but at a later meeting, mentioned that he was remaking “Mysteries of Love” with a full orchestra and suggested that she perform the vocals. Elena found his offer “both scary and extremely exciting” and recorded the song in the transcendental, delicate vocals that are her trademark. “It was a personally satisfying moment for me,” she says. “Angelo loved what I did with his song, and he was generous and gracious enough to let me use it for my new album, 1888. The story might have ended there, but Elena couldn’t let go of a certain idea. Elena had met Michael Sternfeld through the David Lynch Foundation during Michael’s five-year stint as event producer for events featuring Paul McCartney, Ringo, Sheryl Crow, Moby, The Beach Boys, Jerry Seinfeld, and Jim Carrey. They decided to shoot the music video in Fairfield, Iowa, home of Maharishi University of Management (MUM). Michael set out to assemble the production team, recruiting directors Amine Kouider, media and communications faculty at MUM, and Sam Lieb, head of DLF.TV, as well as co-producer Donald Revolinski, faculty of the David Lynch MA in film at MUM. The only problem was, there were only three weeks left before the concert. What transpired in just three long days and nights of shooting outdoors in freezing March temperatures was nothing short of magical. 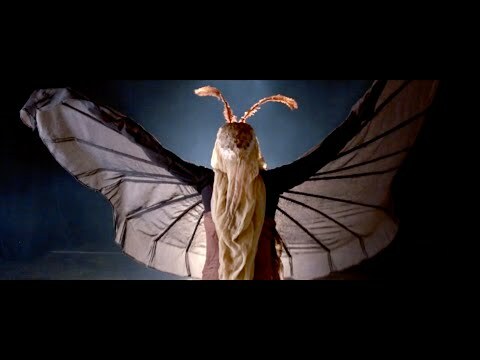 The video’s beautiful yet disturbing visual images of the cocoon unravelling into a butterfly, performed by S.B.Woods, a performance and installation artist who has been practicing the TM technique for 34 years, fit perfectly with the shared vision for the film. The motif of light and dark reverberated through images of the video’s mystical forest set, created in two days of freezing temperatures by “tree woman” Cherie Sampson, an environmental performance and video artist who previously taught at Maharishi University of Management and now teaches at the University of Missouri. After the last day of shooting ended at 4:00 a.m., there were only five days left for the three editors to complete post-production editing—a task that would normally require three months of work. The crew waited as David Lynch and the producers of the LA concert reviewed the video. Finally, just a week before the concert, word came that David Lynch not only loved it, but it was the only music video approved for the live concert.